I am sure that regular readers have noticed I have been posting and commenting less on this blog in recent months. I've been commenting less mainly because the comment volume has long since surpassed my ability to read and reply. The same is true for the e-mails I receive, but I have been trying to briefly answering a few of those each day. If you sent me an e-mail that I didn't reply to, it is probably because it wasn't short enough, because I already have a post about your question, or because I received it on a very busy day. I have a much busier schedule than I had six months ago, when I was posting weekly. The things I think about these days (which are the things I post about) are more difficult topics that require more time to get on paper. Compare, for example, my recent posts to the ones about wearing heels or matching your underwear. I am working on a book, which has been taking most of the free time that I have for writing. In fact, just last night I wrote a great post titled "Why Your Ex (Who Dumped You) Is Still Contacting You," but I plan to use it as a chapter in the book. I will make a separate post with more details about this later. Anyway, I am still here, and still working, but in the background. Hang in there - I still have a lot to say. If you don't want to keep checking back for new posts, you can receive a notification the next time I write something. Just enter your e-mail address in the "Follow By E-mail" box, which is about halfway down the left side-bar. Or you can follow the blog on Twitter, where I always announce new posts, and sometimes also share a quick thought about relationships, or a link to a relevant post. In the meantime, I encourage you to read through the older posts that you haven't explored yet. I do notice (via the blog traffic statistics) that when I take a break from posting, readers start to explore older posts. And I think that is important from time to time, because a lot of the material on here is best understood in the context of the other ideas on the blog. Wow!!! great that you're writing a book :) I look forward to buying it! Love all your posts on all those "Dating Rules"!! Good to hear! We miss you, oh giver of knowledge into the male psyche! Thrilled that you're writing a book. As you already know, your blog is a longstanding favorite of mine. Wishing you all the best and success in the future- can't wait till a copy is on my shelf! Andrew: I read a really great post from a blog you've referenced in the past (below). One thing I hope you'll write about, in terms of self-improvement, is self-esteem/emotional health/, and how those issues play out in relationships. I look forward to reading your book also. 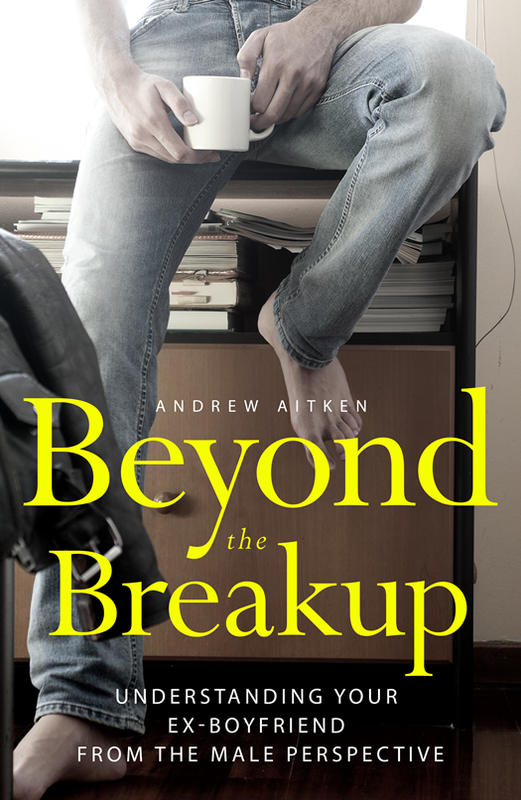 Looking forward to the book, Andrew. It's unfortunate that you won't be publishing the "Why Your Ex (Who Dumped You) Is Still Contacting You" post. That would have been immensely helpful to me two years ago. I could have used the ex still contacting you post literally a week ago.. but I'm glad we'll get to read it in the book. I'm definitely buying it once it's out! I am glad I found this blog. I have been reading the old posts and sharing with my girlfriends. As to the "why your ex who dumped you keeps contacting you" I think I have an idea...this happened to me last year. He wanted to see how I was doing, to see if he still had influence and power over me. If I would drop everything if he came back. It was manipulation. He did not really care for my well-being.. he was just keeping me as a back up plan. I didnt allow him to play with me and I am with a new amazing guy. Today I heard a man say that men feel emotion very strongly (the example used to illustrate was men going nuts at sports events when their team is winning), and that feeling emotions strongly like this makes men uncomfortable and out of control so men work to suppress them. It's often said that society teaches men to suppress their emotions from an early age because expressing emotions is unmanly. But what I heard today points to something different, namely that it's the way men feel emotions (explosively?) that make men want to avoid emotions. Wanted to get your take on this. I've been visiting this website non-stop, reading and re-reading posts. So helpful! Looking forward to the book, Andrew. Today's post on what men wish women knew about them might be of interest to the readers here. Han-this is very insightful and helps better understand your species lol Great discussion. In addition to Andrew's stuff, I wished someone had told me these things sooner!!! it's been over a month since a real post. You runnin a blog here? Hi Andrew, I just found your blog today and have spent almost two hours reading as much as I can, because everything you're writing makes sense! I love it. I can't wait for the book, especially now since you mentioned the chapter "Why Your Ex (Who Dumped You) Is Still Contacting You". It's so bizarre, because this actually just happened today. He wanted to hook up, and I basically told him no, that I was going to make room for someone who actually wants to be with me, and the funny thing is that he got mad! I guess he was just embarrassed and wanted to hide his "wounded pride" as you had called it. But it's just so weird that he would contact me after he dumped me, all the while I'm trying to move on. Thanks for posting, I look forward to more posts in the future! Man...I could have reeeeallly used the "Why Your Ex (Who Dumped You) Is Still Contacting You," post back in October. Am still pretty interested in reading it though; can't wait for it to come out!